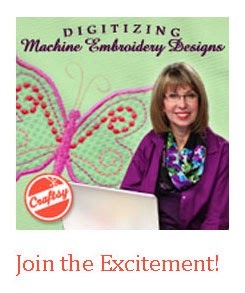 Cookie's Embroidery and Sewing Creations: One stop machine embroidery software for MAC and Windows Users! 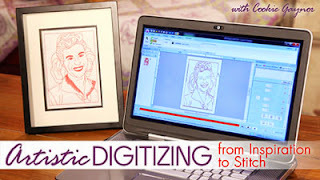 One stop machine embroidery software for MAC and Windows Users! Embrilliance and Stitch Artist! The Embrilliance platform works on both Windows and Mac computers. No dongle to transfer back and forth. One license let's the consumer keep a copy on both Mac and Windows computers. Of course, the computers must belong to the owner of the software in accordance to license agreement. My own plugins are Embrilliance, Stitch Artist 2, and Editing, and my plan is to add Density for those purchased designs that are too stitch intensive. All of us own some of those bullet proof designs! Another use for Density would be to overlap two designs and remove the built up stitches underneath for combining! The learning curve of the modules is pretty easy. If you are not into digitizing complex designs then Stitch Artist 1 certainly offers many nice features plus appliqué capability. An added feature exists in Stitch Artist 2 with the turning of a corner using the column tool which may or may not be important to you. I've owned the software since May and added Editing after the original decision to work with Stitch Artist 2. Using the lazy days of August to test out the features that my students ask about in Crafty to duplicate the lessons in my class. It works very well for the course. The text is lovely as you can see in my pillow. 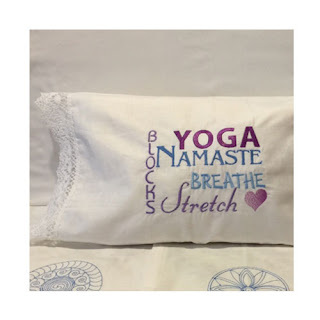 The pillow makes a nice gift for any student of Yoga who takes their "corpse pose" seriously at the end of practice, LOL! I tested out the gradient fill for the heart element, which proved to be another delightful and intuitive feature. It is easy to reorder the elements. 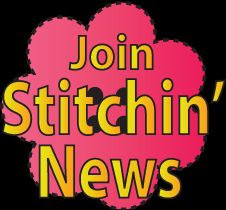 I prefer to stitch from bottom to top, and it took only seconds to rearrange things accordingly. The lettering is easy to manipulate, as either individual letters or whole words. Stitching simulation is available: Yes, you can watch it stitch on the screen prior to stitching it out on your embroidery machine. The pillow was done with my Windows computer that I use for local classes. 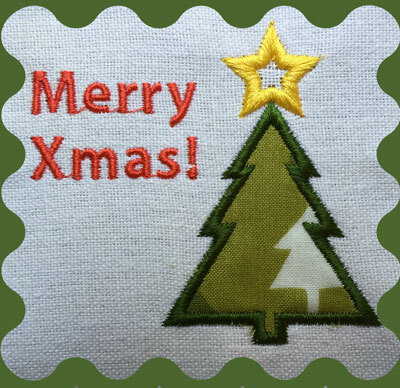 Here is one done on the Mac that took just a few seconds to create the appliqué using built in shapes that come with the software. I have such an appreciation for the crisp sharp points in the star and tree. This was done in a 4x4 hoop which is always the litmus test for me. I am a software junkie and have several. Each software offers unique features. The advantage of being able to have the same software on both the Mac and Windows computers is a real bonus. The layouts are the same. They work the same. They stitch out equally great. Because you can add the modules you desire, it keeps the costs within budget. In addition to MasterWorks II, I have several Embrilliance modules. The nice thing about that is that Brian Bailie designed both pieces of software. The software is very intuitive. My 13 year old walked up to my computer and put together a text design, without any previous experience. It's that simple! Adding fonts is a breeze due to the implementation of the BX file format. There is plenty of support available in YouTube videos and their tech support has always been very quick to respond.